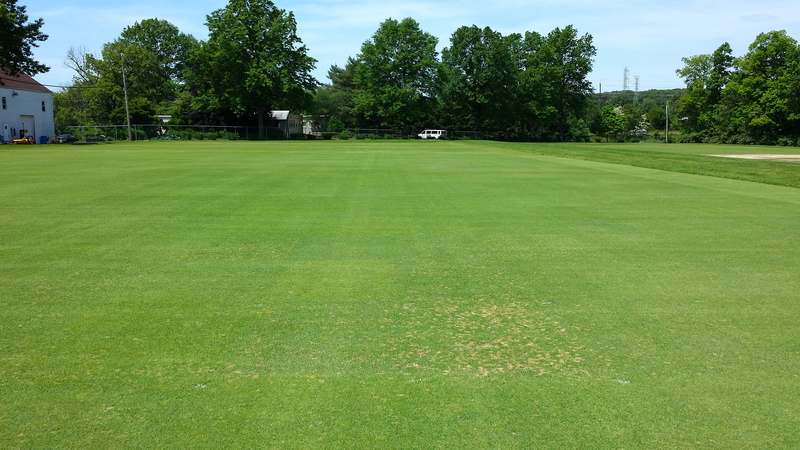 Exactly like Dr. Bruce Clarke teaches, Memorial Day arrives and so does dollar spot disease. highly susceptible to dollar spot disease. Dollar Spot Disease seen in foreground. Symptoms appear as round, brown to straw-colored spots approximately the size of a silver dollar. On short cut turf, the spots with advanced damage can become somewhat sunken. At taller cutting heights (greater than 1 inch), the damaged spots are larger and more diffuse. Highly susceptible grasses will be the first to exhibit symptoms including annual bluegrass, creeping bentgrass (depending on cultivar), and perennial ryegrass. Tall fescue and most Kentucky bluegrasses will be more tolerant of this disease. Cultural techniques that can suppress dollar spot disease include disruption of dew and guttation water in the morning and increasing N fertility (if it is low). Mowing early in the morning (disruption of dew) should also be helpful.